The prestigious show is held in the grounds of Hampton Court Palace every year and, if you’ve never been, make a note in next year’s diary. If you have visited – lucky you! 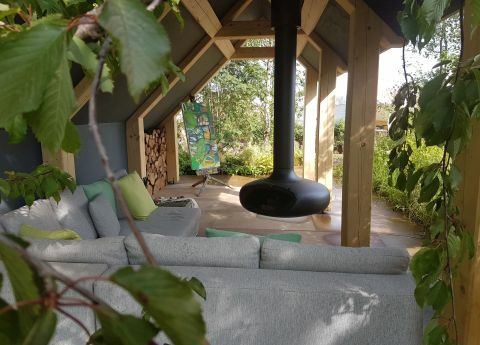 Breckland Beauty Garden was designed and built by Jody Lidgard, Nicholas Fryer and Tim Lidgard at Bespoke Outdoor Spaces. And it really was a beauty. Breckland is an area in Norfolk and the garden was designed to capture a snapshot in time of the interchangeable Norfolk landscape. 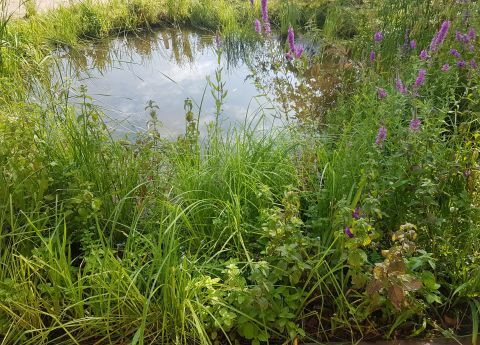 It also included a pretty pond, inspired by a ‘Pingo’s’ post-glaciation kettle pond, one of many found in this area of Norfolk and home to lots of native wildlife. ‘Pingo’ (in case you’re wondering) is apparently an Eskimo word for hill. We’re not sure how this ties in with ponds… or how Eskimos got involved, but these ponds are quite rare – created at the end of the last ice-age and, in this part of the world, largely left untouched since then. The team set the garden within the grounds of an ‘old farmhouse on the edge of a village’, surrounded by scrubby, sparse woodland. It was incredibly tranquil with lots of stunning planting, including aromatics, with contrasting textures and forms. To find out more about the garden you can check it out here. As for our Manutti Zendo corner sofa – it looked just fab. We think this shows just how versatile the Zendo is. 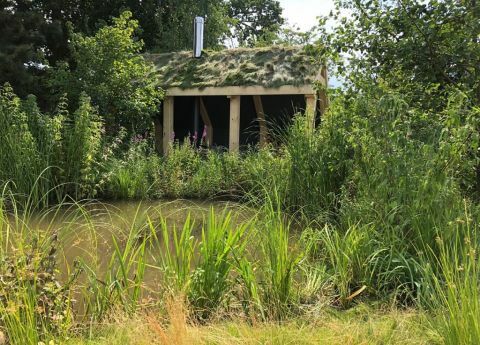 Perfectly at home in a Norfolk ‘wildlife garden’ in a rustic farmhouse, or sitting on the terrace of a Chelsea townhouse. 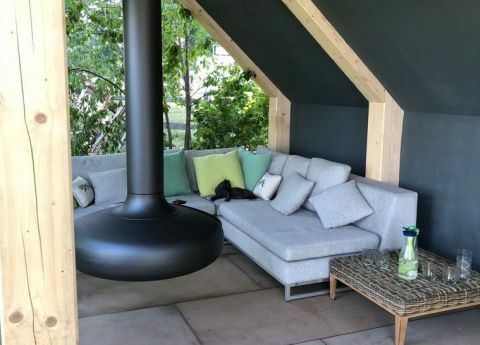 With credentials to suit both: completely modular (create your own shape to fit the space you have) weather-proof and covered in the same high tech fabric as used on smart yachts, with quick-dry, fast-draining cushions. And as comfortable as any indoor sofa we know of. Manutti are world experts in the design of outdoor furniture and they use only materials that are built to last… for years; seams that are welded as well as sewn for extra durability; cushions that are specially designed so that any water will simply drain straight through. Another of our outdoor sofas also went out to the team over at Romo Fabrics for a shoot earlier in the year. They chose the new Weave Sofa by our Spanish manufacturer Point for a shoot for their summer 2018 catalogue. Weave, which romantically takes its name from the Baya Weaver birds who build their nests by precise weaving and knotting, was designed by Vicent Martinez, and the look was part of a big trend this year for hand-woven designs. It has a rust proof aluminium frame and is woven with a strong 8mm thick polyester rope which is sunlight and weather resistant, as well as being colour fast. 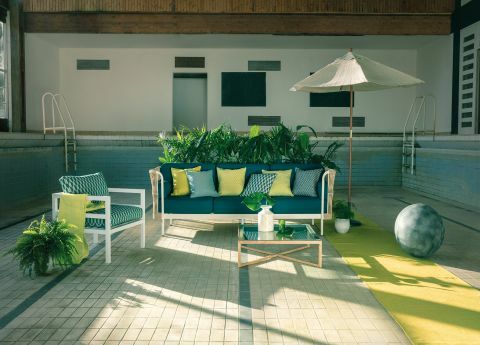 Romo’s imaginative location for their shoot was a disused swimming pool and they covered the Weave sofa with one of their new outdoor fabrics called Pergola, in teal. As well as being incredibly practical and durable, the fabric range has a mix of geometrics, plain and semi-plain weaves. You can see some of the colours and patterns on offer with the scatter cushions used to style the sofa – beautiful peridot yellows and azure blues. And a testament to how soft the material is – it can be used indoors and out. Check out the full Point Weave range here. So, what a summer. 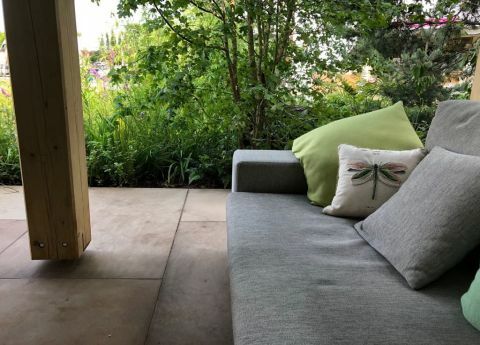 Long may it last… and if you nip over to our site now you can take advantage of our 15% off summer sale, including all garden ranges. Next PostNext If our customers are happy – so are we!